"Inside Out" might turn box-offices upside down. Reviewers are singing the praises of the Pixar animated film by "Up" and "Monsters, Inc." director Pete Docter as one of the studio's best ever. The story centers in the mind of an 11-year-old girl named Riley, where the main characters embody a few of her ruling emotions with all too familiar voices: Anger (Lewis Black), Sadness (Phyllis Smith), Fear (Bill Hader), Disgust (Mindy Kaling) and Joy (Amy Poehler) as they react to situations in her transitional life. The majority of the story takes place in the girl's mindscape, in the nerve-center, a spaceship-like control room where the plot's primary conflicts play out among Riley's crew of Emotions. In addition to a skin-tingling soundtrack by veteran composer Michael Giacchino, and the smart screenplay by Docter, critics are specifically impressed with the originality of the story and the sophistication of the narrative based on abstractions turned literal. "Time and again, the Bay Area studio aces the tricky high-wire act of cranking out kids' movies that adults can also enjoy on a different--and deeper--level. Now, with their latest film, the transcendent and touching "Inside Out", they've taken that approach a step further. They've made a movie that's so smart and psychologically clever, it may leave little ones scratching their heads wondering why their parents are laughing so hard and getting so choked up. It's the first film I know of that's been marketed to kids, but is in actuality made for grown-ups." Forbes contributor Mark Hughes gives kudos to the studio and Docter for providing an extremely strong female-centered film said to be inspired by Docter's own daughter when she was 11-years-old. "Female audiences have been showing a great deal of power at the box office in recent years, and Disney seems especially determined to deliver content featuring strong female leads in great stories that speak to female viewers," Hughes wrote. "Pixar is Disney-owned, but only has one female-led film on their resume so far - 'Brave.' That's about to change. Pixar's newest entry (and their first release in two years) 'Inside Out'...is Pixar's best film since 'Toy Story 3,' one of their best ever in fact, and I think it's destined to be one of their most successful." "It would be difficult to overpraise the vocal stylings of Amy Poehler, who conveys not just supernatural exuberance but the semi-tonal quavers of doubt that keep that said exuberance from being cloying or cartoonish. Michael Giacchino's score is marvelous even by his own exalted standards. Each region of Riley's mind has its own melodic character but exists in relation to the larger organism -- a factory in which every cog and pulley is soulfully in tune. Like, come to think of it, Pixar." 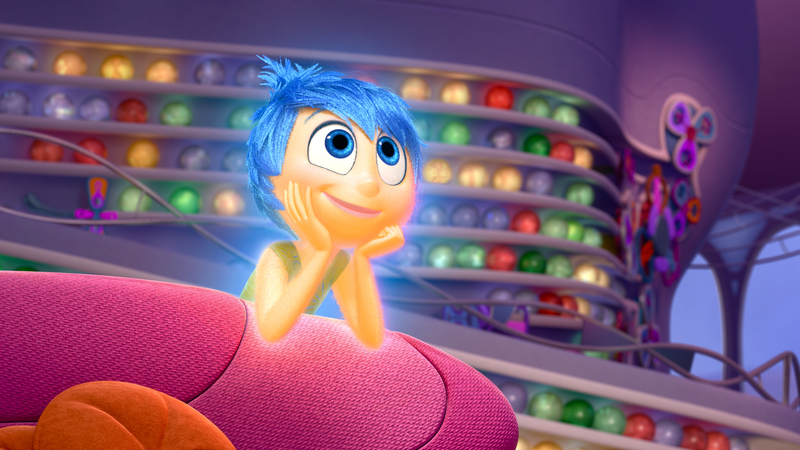 ""Inside Out" is an absolute delight -- funny and charming, fast-moving and full of surprises. It is also a defense of sorrow, an argument for the necessity of melancholy dressed in the bright colors of entertainment," wrote Scott. "I would gladly catalog the movie's wittiest inventions and sharpest insights, or try to draw a word map of Riley's brain. Nothing would be spoiled. But I'll leave you the pleasure of discovery, noting only that you should keep an ear out for Michael Giacchino's music and Richard Kind's voice, and your eye peeled for sly philosophical sight gags." Tell us: Do you plan to see "Inside Out" this weekend?